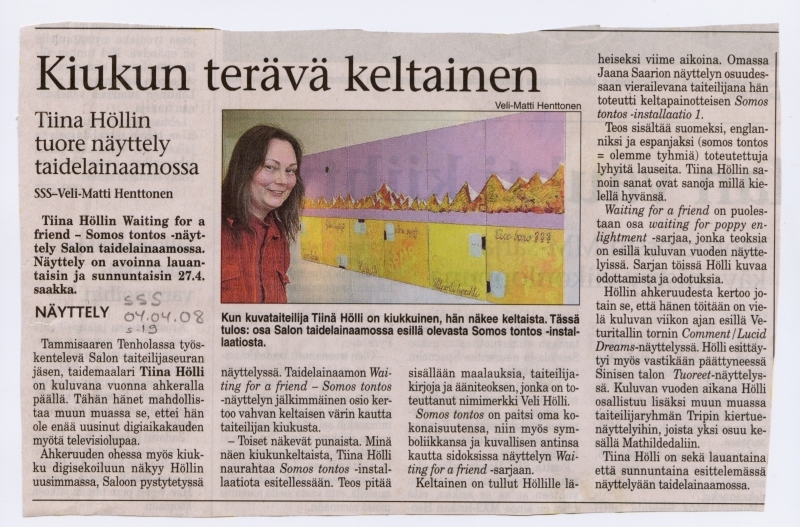 " 4 x 28 = 107 "
Tiina Hölli is a contemporary painter from Finland. 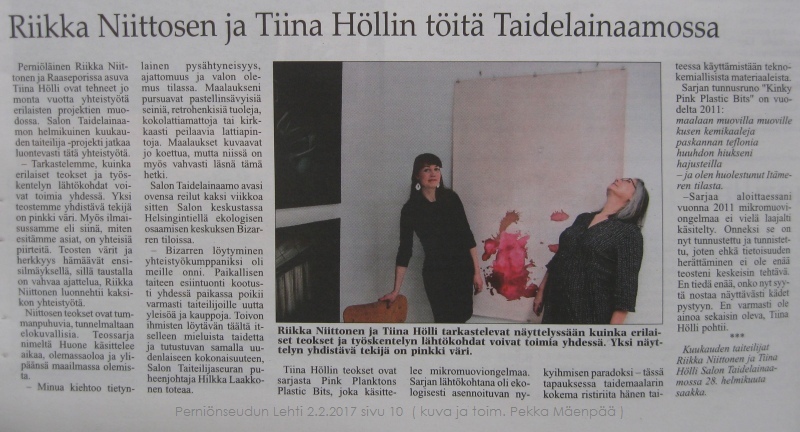 Tiina Hölli (1960), visual artist, curator, writer and poet. 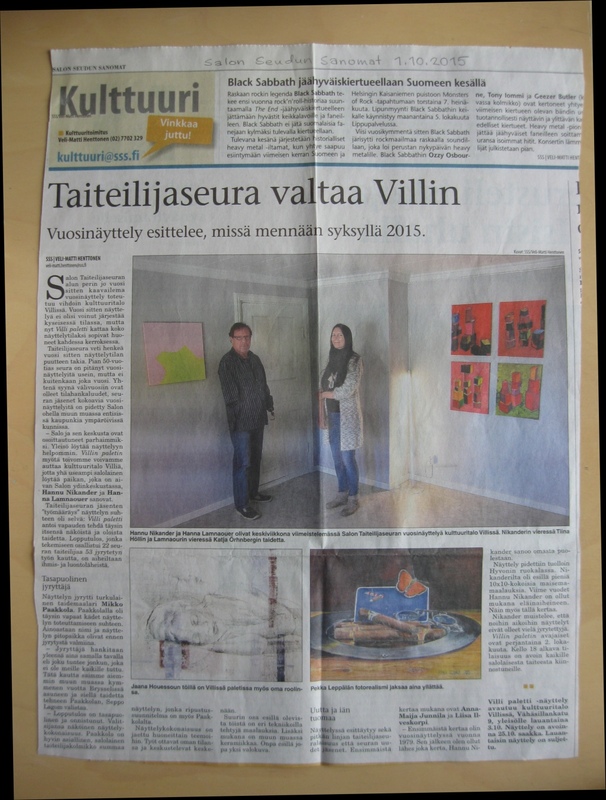 Lives and works in Finland. Graduated 2002 as a painter from Pekka Halosen akatemia Finland. 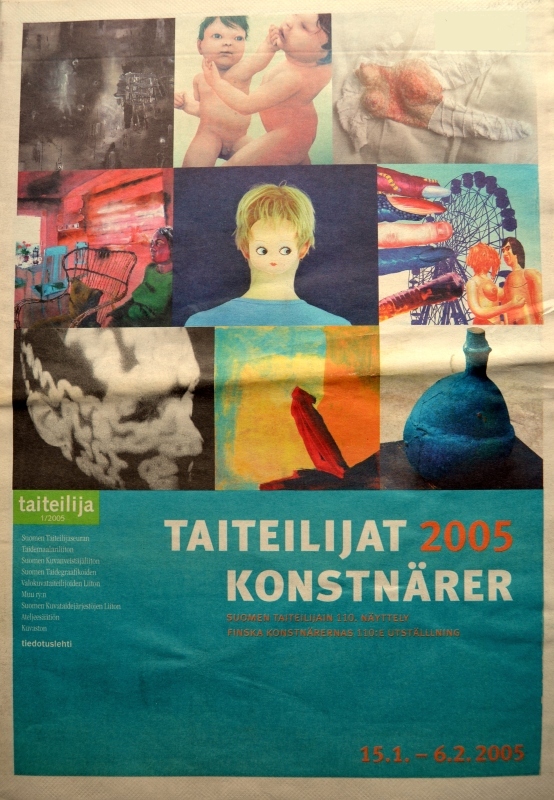 Member of the Finnish Painters' Union. Working in the field of modern painting and contemporary visual art, Hölli's works are mainly abstract, coloristic acrylic paintings. Solo and co-exhibitions, performances and environmental works since 1998, conceptual works in different diaristic forms and various timespans, collaborations with other artists, and diverse curatorial projects. 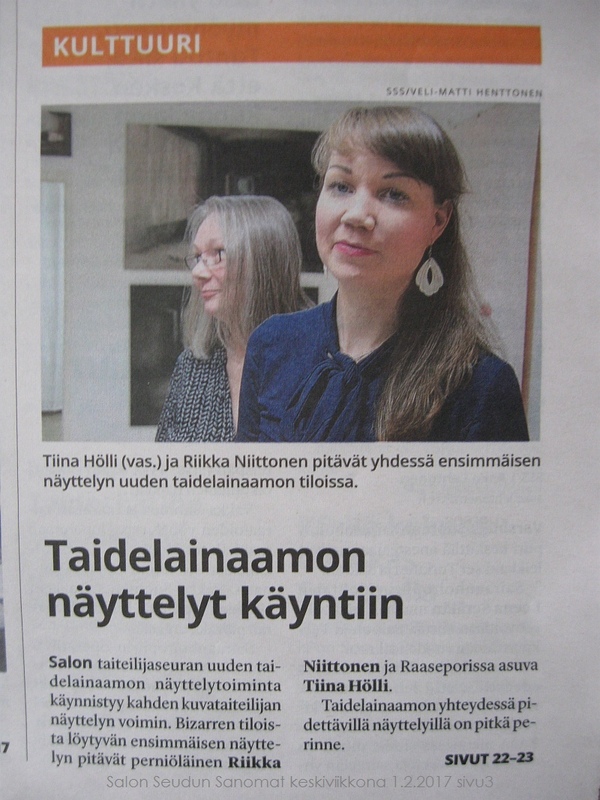 Tiina Hölli : NOW / A.I.R. Apply an e-service permission to use images I have created. Copyright society Kuvasto represents me. 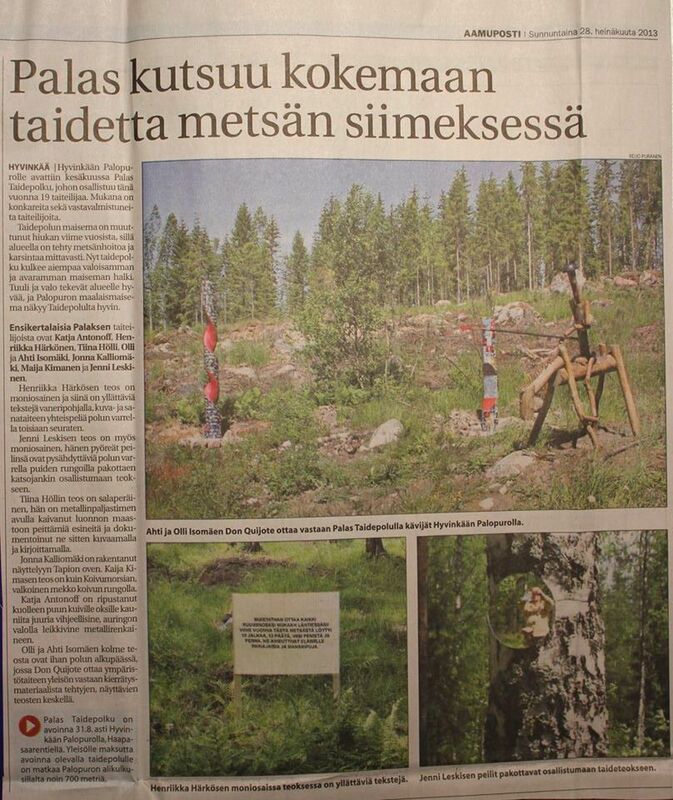 Hae helposti kuvieni käyttölupaa sähköisesti. Tekijänoikeusjärjestö Kuvasto edustaa minua.
" ArT-PROJECT- -T i N- D A N i " .. Visitors' Book - Say hello ! 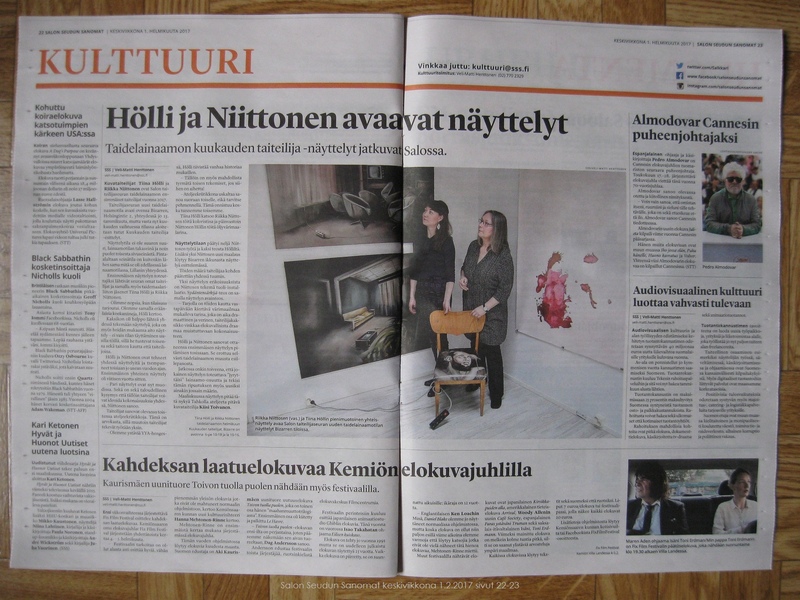 Tiina Hölli's painting on page 13 in article " Minuus ja identiteetti "
2017-02-01 Salon Seudun Sanomat : Hölli ja Niittonen avaavat näyttelyt. 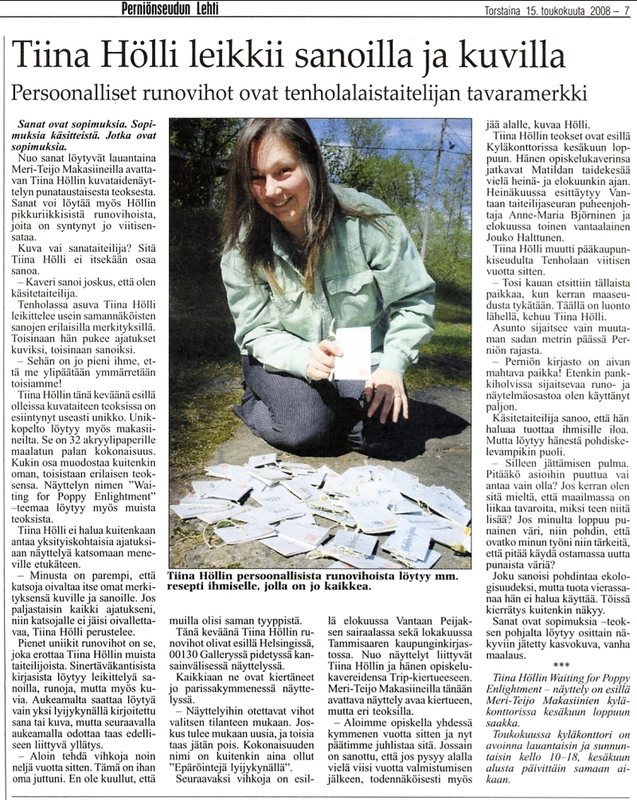 2009-05-28 Perniönseudun Lehti : " Taiteilija tekee paljon ilmaista työtä yhteiskunnan hyväksi "
2007-06-21 Perniönseudun Lehti : Mikä on toimialasi tässä viehättävässä ruukkiympäristössä? 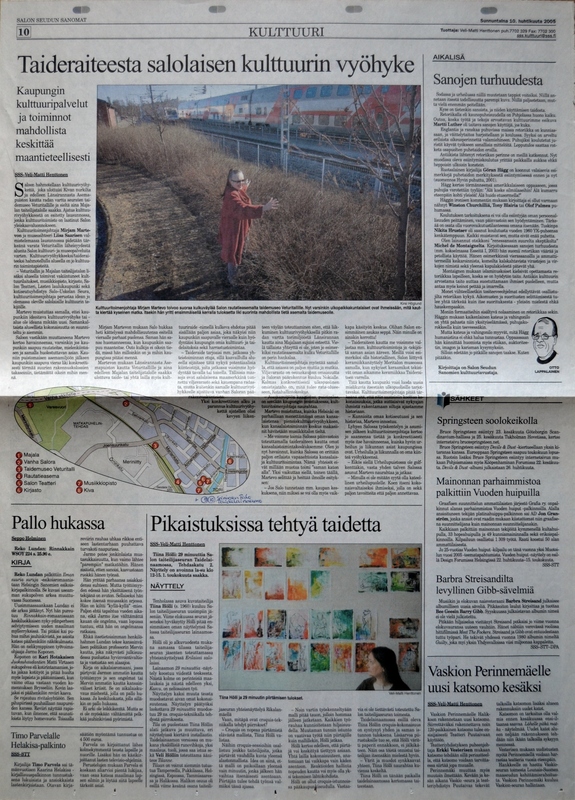 [Helsingin Taidehalli 15.1. 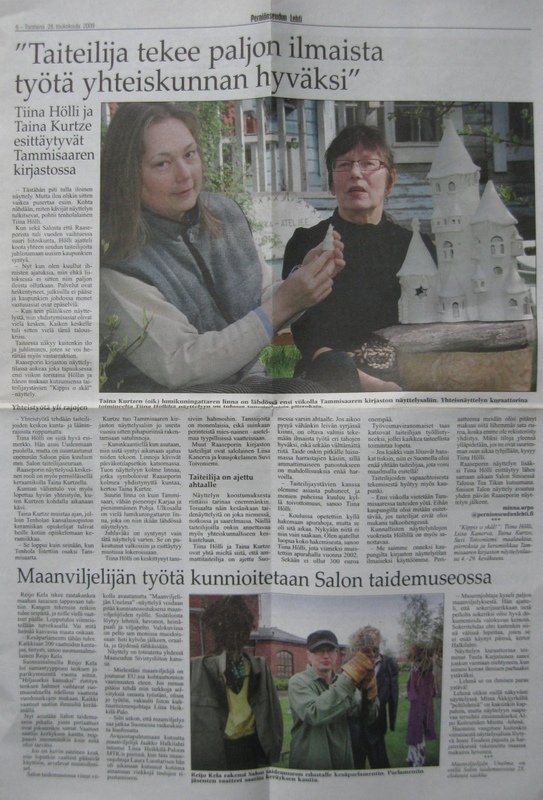 - 6.2.2005] / [järj. Suomen Taiteilijaseura = Konstnärsgillet i Finland]. - Helsinki, 2005. - 11 s. : runsaasti kuv. 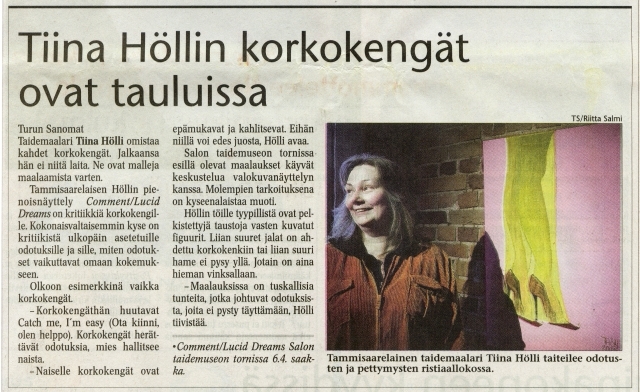 The Official Website of Visual Artist Tiina Hölli. YOU HAVE SUCCESSFULLY LANDED IN THE ARCHIVES. PLEASE STAY SEATED UNTIL ALL LIGHTS GO OFF. Whatever you do, do not panic. 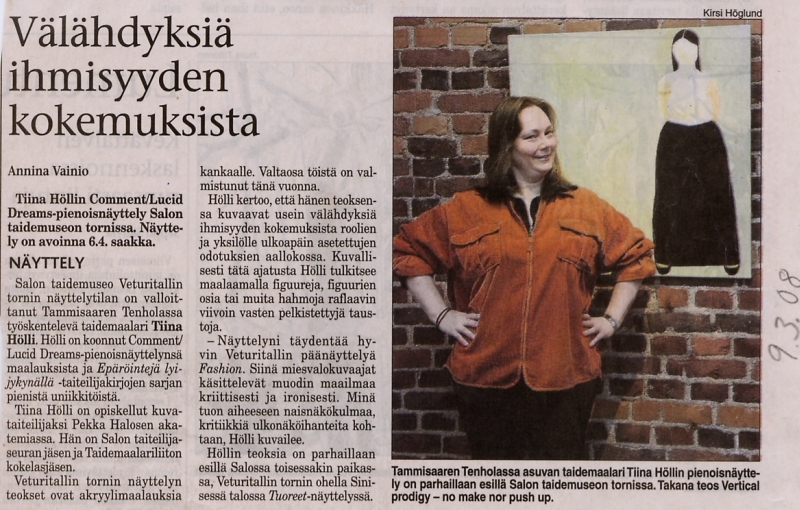 Copyright © 2019 Tiina Hölli. All rights reserved. 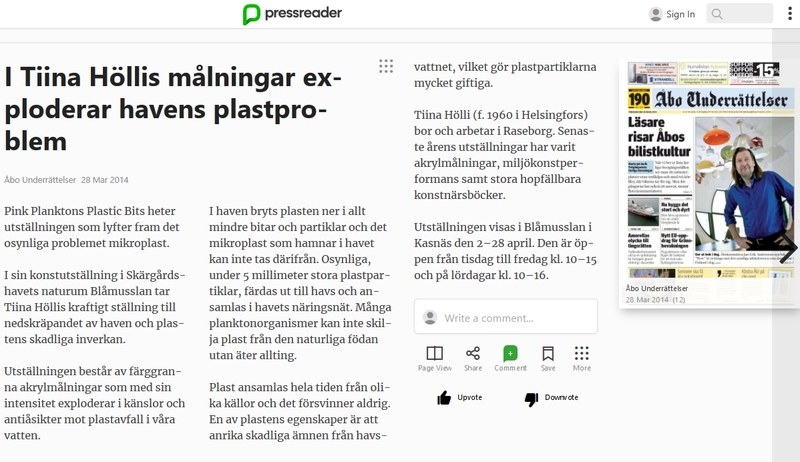 Excerpts and links may be used, provided that full and clear credit is given to Tiina Hölli with appropriate and specific direction to the original content. Unauthorized use and/or duplication of this material without express and written permission from this author and/or owner is strictly prohibited. All images are protected by copyright law and may not be copied or reproduced without permission from the artist. All photographs presented here are the sole property of Tiina Hölli unless otherwise noted. Published works are protected under domestic and international copyright laws and are not considered to be public domain. No photographs may be reproduced, copied, manipulated, or used whole or in part of a derivated work, without written permission. All rights reserved. Copyright society Kuvasto represents me : e-service permissions to use images that I have created. Kuvieni käyttölupa on helppo hakea sähköisesti. Tekijänoikeusjärjestö Kuvasto edustaa minua.